I’ve been feeling brave this week: I’ve decided that I can bake! I can bake, I can bake, I can bake… There is really no reason why I shouldn’t be able to bake. It just requires an extra measure of precision and attention. Simple. I. Will. Do. This. 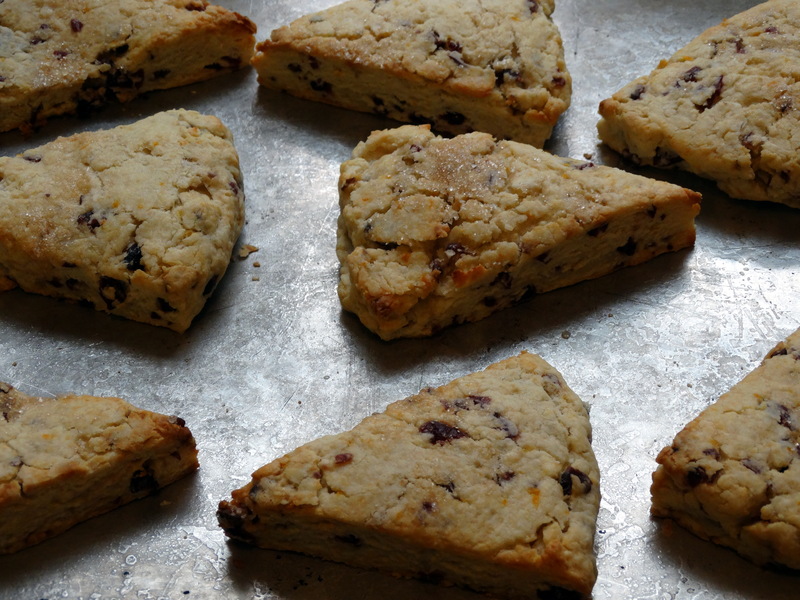 What could be a better, more forgiving experiment than a batch of delicious, buttery scones? Sweet and salty, intentionally dry, almost impossible to screw up. What could go wrong? But of course the little baking devil on my shoulder chimed in, rattling off a laundry list of the pitfalls I’d encounter. But I pressed on, undeterred, and tallied up the ingredients I needed. Making these scones was an interesting test for me mentally. I went through an array of feelings throughout the process. First, I was confident! Then I started combining the butter with the dry ingredients and fear set in. “Is it supposed to look like THIS?” “I have to be doing this wrong.” “This can’t be right. F#&*K.” Things smoothed out towards the end. I began thinking that my scones *might* turn out okay after all. I didn’t overlook any ingredients or steps, so I had that going for me right…? I’ll save you the suspense: as you might have guessed since I’m posting the recipe, my scones were a success! Phew! Now I get to share this yummy recipe with you! What will you need? 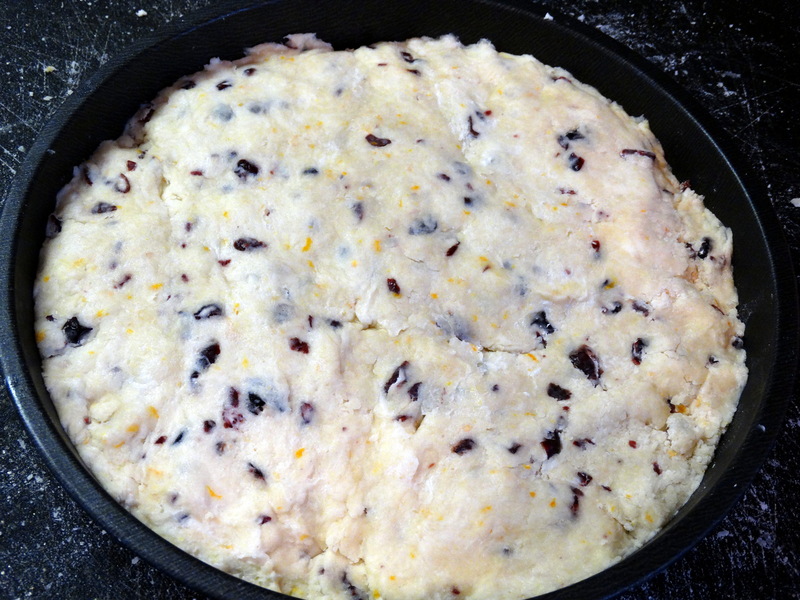 Flour, baking powder, sugar, salt, unsalted butter, dried cranberries, an orange, heavy cream, and turbinado sugar. Add 2 cups all-purpose flour, 1 tablespoon baking powder, 3 tablespoons sugar, and 1/2 teaspoon fine sea salt to a food processor fitted with an S-blade. Cover and pulse six time to combine. 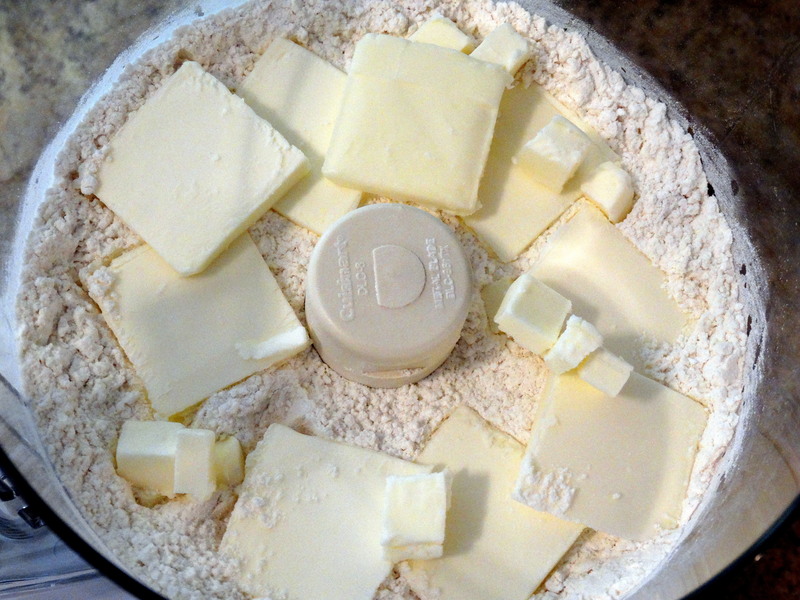 Thinly slice and/or cube 5 tablespoons unsalted butter and add evenly on top of the flour mixture in your food processor. Cover and pulse 12-15 times, until combined and butter is evenly dispersed. 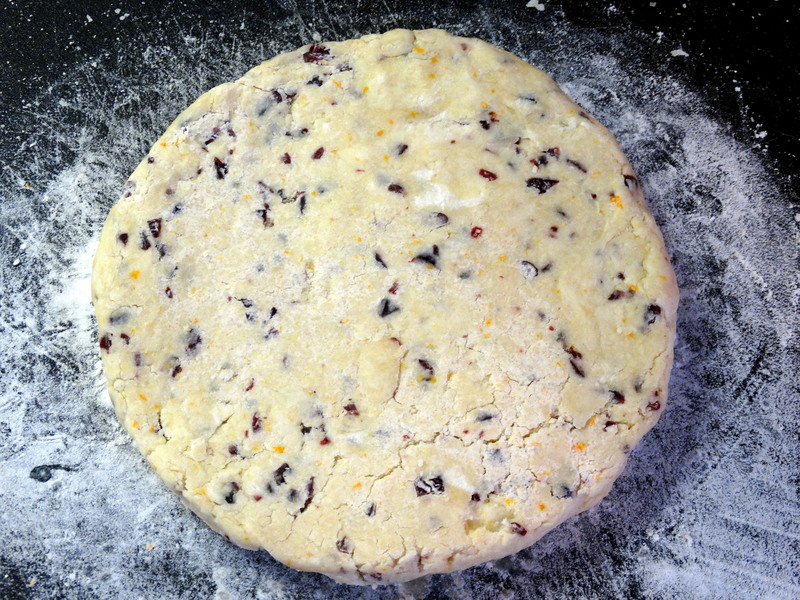 Next, add 1/2 cup chopped dried cranberries and 2 teaspoons orange zest to the food processor. Cover and pulse several times to combine. 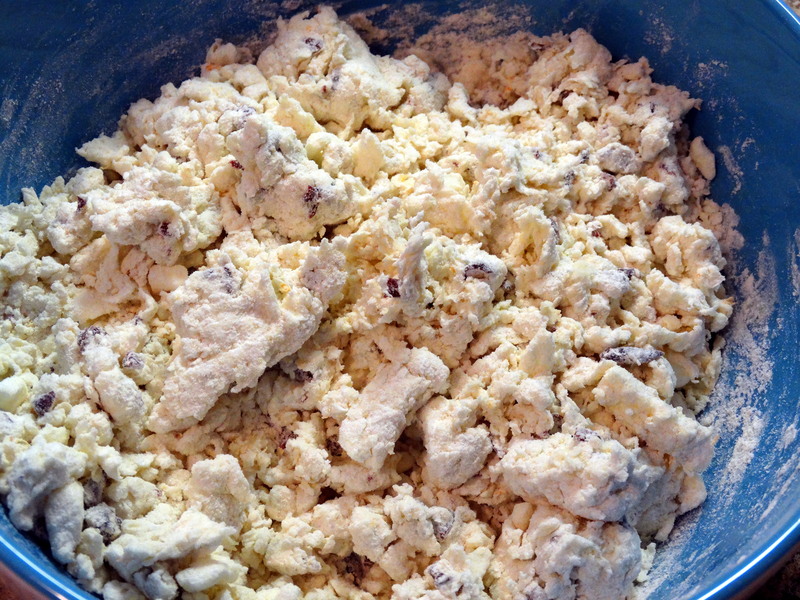 Transfer the flour mixture to a large mixing bowl and add 1 cup heavy cream. Stir to combine, just until dough begins to form. Transfer the dough to a lightly floured surface. Kneed slightly and form into a tacky ball, about 15 seconds. Press the dough into an 8″ round cake pan. Flip the pan over onto a lightly floured surface. Cut into 8 slices, the same way you would cut a cake or pie, and sprinkle the top with 1 tablespoon turbinado sugar. 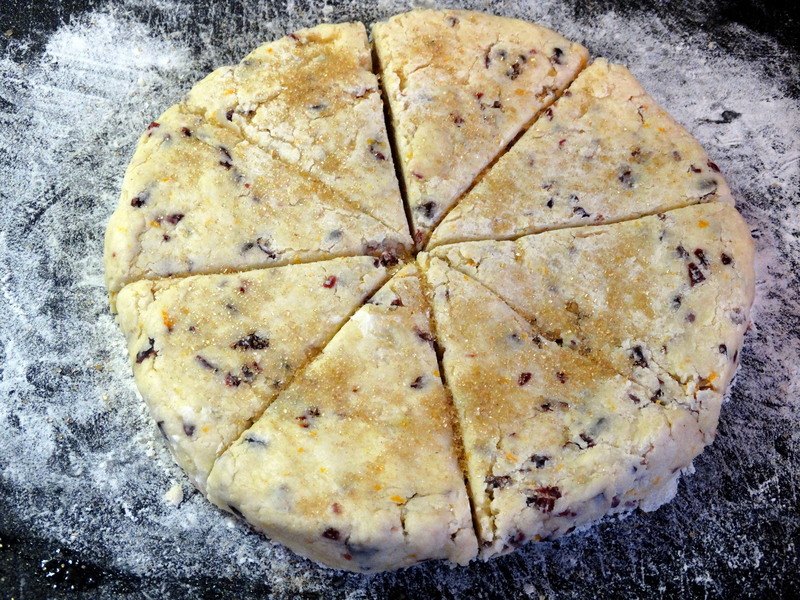 Transfer each slice to an ungreased baking sheet and bake until light brown, about 15 minutes. Cool on a wire rack for 10 minutes before serving. Tip: If you’d like to make these a few days ahead of time, you can make them as directed and put them in the freezer on the baking sheet. Once frozen, transfer them to a large freezer bag. No need to thaw them before baking! Just return your scones to a baking sheet and bake an extra 2-3 minutes. If you’re only making these one day ahead of time, just cover the uncooked scones on your baking sheet with plastic wrap and refrigerate until ready for baking. 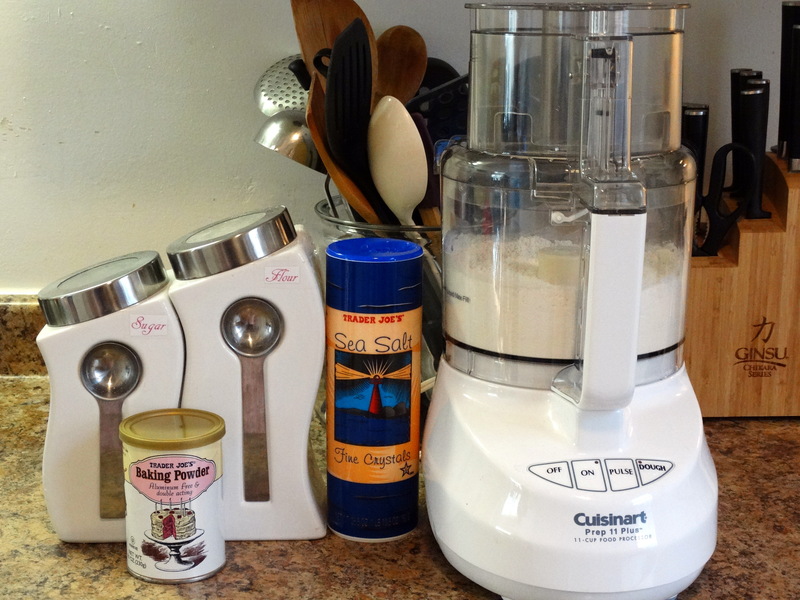 2) Add 2 cups all-purpose flour, 1 tablespoon baking powder, 3 tablespoons sugar, and 1/2 teaspoon fine sea salt to a food processor fitted with an S-blade. Cover and pulse six time to combine. Thinly slice and/or cube 5 tablespoons unsalted butter and add evenly on top of the flour mixture in your food processor. Cover and pulse 12-15 times, until combined and butter is evenly dispersed. 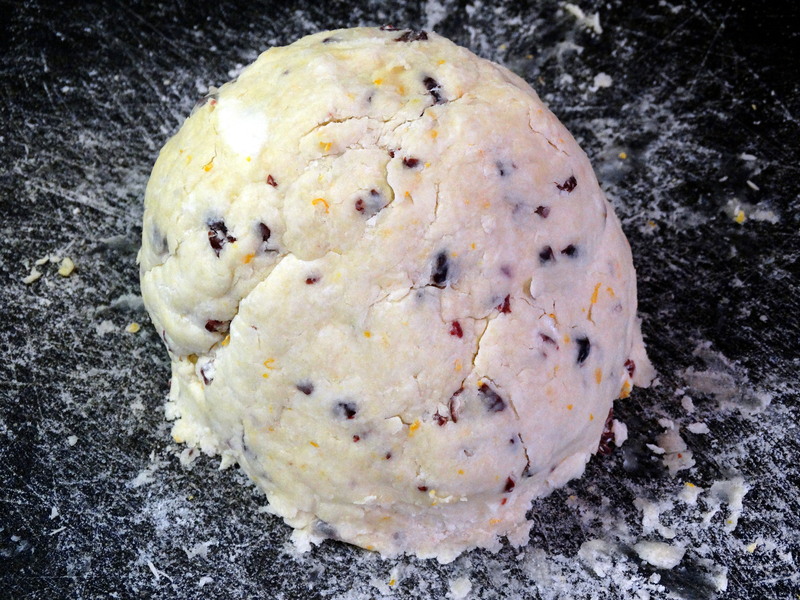 Next, add 1/2 cup chopped dried cranberries and 2 teaspoons orange zest to the food processor. Cover and pulse several times to combine. 3) Transfer the flour mixture to a large mixing bowl and add 1 cup heavy cream. Stir to combine, just until dough begins to form. 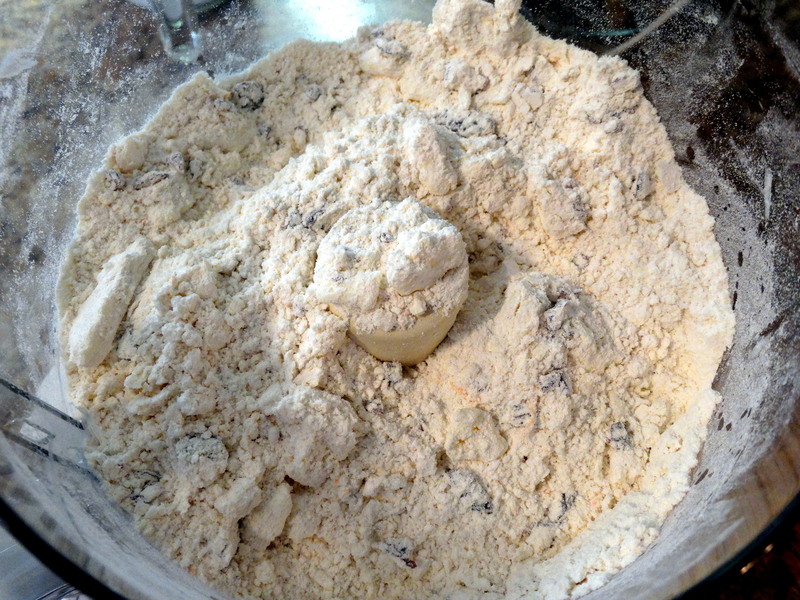 Transfer the dough to a lightly floured surface. Kneed slightly and form into a tacky ball, about 15 seconds. Press the dough into an 8″ round cake pan. Flip the pan over onto a lightly floured surface. Cut into 8 slices, the same way you would cut a cake or pie, and sprinkle the top with 1 tablespoon turbinado sugar. 4) Transfer each slice to an ungreased baking sheet and bake until light brown, about 15 minutes. Cool on a wire rack for 10 minutes before serving. Looks soo tasty Marta. 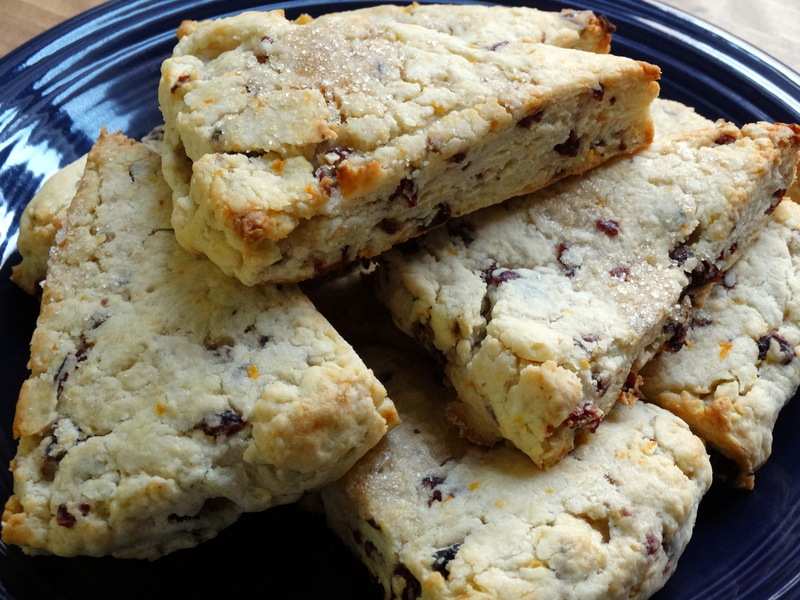 I’ve never been a big scone guy, but these look like a must try!